When I first decided to self-publish, I knew that social media would be a big component of book marketing. I opened a Twitter and Instagram account and set up a page on Facebook. Primarily, my focus was on putting out consistent content while sharing my book with the world. Or at least the people following me, which was maybe around 50. Social media didn’t help me sell hundreds and hundreds of books at the release of The End of Refuge, so I put it on the back burner and looked for other ways to promote my books. Instead, I used Twitter to network with other writers and only occasionally posted on the other two platforms. At this point, I saw my follower count grow. So social media is for being social. Huh. After a particularly rough experience with Amazon after one of my countdown deals, I scaled back on paid promos. But with only an ad on Facebook, I wasn’t selling enough copies to even pay for the ad. I finally realized that I wasn’t utilizing all the social media stuff to its fullest. I needed to give it another go. After reading some articles, I learned that people just do not buy things from their Twitter feed. Facebook did a little better at converting fans into buyers, but they generally don’t show page posts to anyone unless you pay them. So…. Instagram! I should have learned after signing up for the first one, but no. Instead, I went through a few, playing them while my daughter and I ate lunch. These webinars aren’t made to help you promote your business on Instagram, they’re made to sell you the full course, which always costs hundreds of dollars. I’ve seen several circles and ladders to success, but never any depth to what the steps are. But, I heard over and over that I needed to find my brand, and elicit emotion, and… actually, I think that’s it. I frequently joke that the reason I use Instagram is to become Instagram famous. But in reality, my goal is to sell my books. Since social media can quickly become an endless time sink, determine what you want to get out of this before diving in. I made a bunch of connections with other authors and writers through Twitter, but ultimately, these aren’t the people who will buy my book. Some of them certainly will, especially if we’re in the same genre, but writers are busy writing. My focus belongs on people who read. So how do I find book lovers? Hashtags, including #booklovers and #amreading. It’s really that simple. I’m an author, so I should be posting about writing and publishing since that’s what I do, right? Well, not really. I’m targeting people who love reading books, so generally, they want books. Books. Not even piles of beautifully arranged books. Just images containing a single book. I try to stick to popular sci-fi novels. Selfies. It is my Instagram. Bonus if I’m holding a book. My books. I wish they were the most popular, but pictures of my books have a self-promo vibe, so I get it. Stock photos. Even though people love beautiful photographs, they don’t like stock photos. I currently use them for my blog posts, but I might need to move away from doing that. Pictures that aren’t book related. At least I thought the cupcakes I made were beautiful. 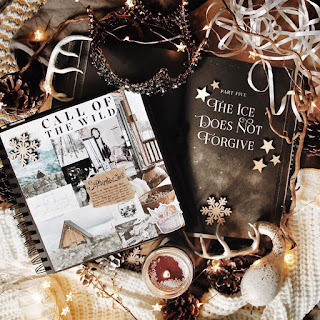 In this picture, along with the two books, there is a crown, star fairy lights, a white knit thing, another knit thing, pinecones, ribbon, a lit candle, wood cut out stars and snowflakes, antlers, sticks, a sprig of some plant, and a squash. I searched the tag #bibliophile hoping to get inspiration for my own pictures and found some gorgeous stylized photos of books. There were cozy reading rooms filled with bookshelves, rainbows of covers, and detailed spreads of a book surrounded by items, which made the image look more like an eye-spy thing. I had a hard time finding a straightforward guide on taking interesting pictures for Instagram. Generally, all I found were guides for capturing landscapes for travel blogs. I’ve found that using only a couple or even no props gets just as much love as book photos with hundreds of other items. Set a book on a table or some interesting surface, open the blinds to get some natural light, and then shoot a couple pics, add a filter, and you’re done. Only two minutes of work for a post that will get tons of likes. I also take a number of selfies. Most of them are in my dining room which has great light and a cool brick wall. And as embarrassing as it may be to use, consider getting a selfie stick. Close-up shots tend to make your nose look huge. Not cute. This was the hardest part for me. It’s not enough to make gorgeous content, add some hashtags, and wait for people to come flocking to you. I’ve seen several people try this and it doesn’t work. I started by searching hashtags including #scifibooks, liking and commenting on the images, then following the creators. Unfortunately, this took forever. 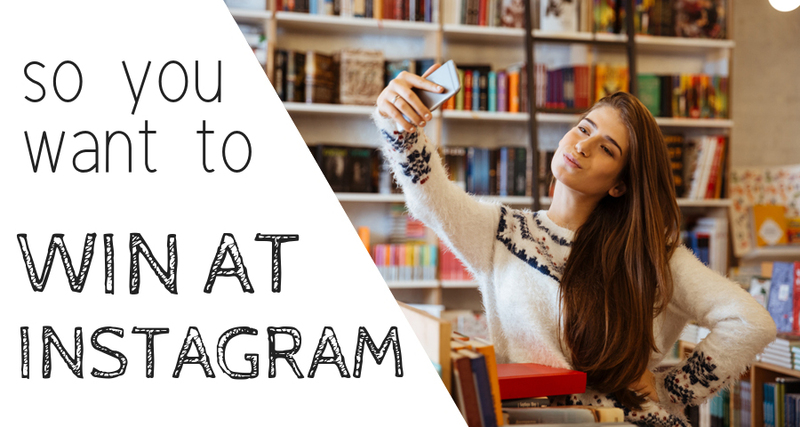 I got an instant spike in book sales, but was spending over an hour a day on Instagram. I wasn’t expecting super fast results, but I also didn’t want to spend so much time on something so deceptively simple. So, I recruited some help to search through hashtags, like images, and follow people. And by help, I mean a bot. Now, I can focus on writing comments for photos posted by cool readers. Another facet of being social is encouraging people to interact with your content. Ask a question in your posts to get others to engage with you. And when they do, like their replies and say something back. Start a dialogue. Building a relationship with your followers is the key to reaching your goal. As I continue to grow my community of readers, social media will play a bigger role in my marketing plan. I look forward to seeing more people posting pictures of my books in their feed. My next book, In the Lurch, releases in November, so I’m excited to see my efforts pay off in a strong launch week. I’ll make sure to update you on how it goes. Until then, go build your Instagram empire!